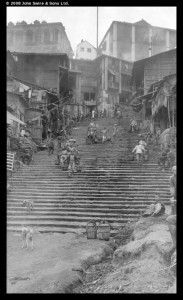 Steps in Taiping Men, Chungking, 1920, Swire collection, Sw19-066. BICC researcher Dr Tehyun Ma is representing the Centre at the launch today of a new exhibition, ‘Historical Photographs of China: Photographs from British Collections‘, ‘1870-1950:英国收藏的中国影像’. While the core of this exhibition was recently on display in Beijing, the Sichuan outing of the show contains many additional rare shots of the city of Chongqing, mainly from the G.W. Swire and Fu Bingchang collections held within the ‘Historical Photographs of China’ website. The exhibiton at Chongqing Tiandi is being opened by Benedict Mann, British Deputy Consul-General in Chongqing, and is the resul of a collaboration between the Consul-General Press Team, RCUK China, and the British Inter-university China Centre. BICC is funded by the AHRC and the ‘Historical Photographs of China’ has been supported as an Academy Research Project since 2006 by the British Academy. The project also runs the related ‘Visualising China‘ portal, and the Visualising China blog, and the latest post there explores Chongqing, the Yangzi, and its place in the British imagination. As part of the Digital China network, BICC staff Robert Bickers, Jamie Carstairs and Tehyun Ma, have been involve in preparing a pop-up exhibiton at the Bristol City Museum (9 February) and M-Shed (10 February). For fuller details see the ‘Visualising China’ blog.